Bar is drop forged and heated for superior strength during prying, digging and tamping with hexagon steel construction for enhanced strength. Gooseneck pattern. Extra wide claw. Beveled nail slot. Ideal for basic demolition work; 3/4" diameter high-carbon steel; slotted claw and beveled ends for functionality and performance. Ideal for basic demolition work; 3/4" diameter high-carbon steel; slotted claw and beveled ends for functionality and performance. Made of forged, high-carbon steel able to withstand 975 ft-lbs. of bending momentum; with a slotted claw, beveled ends and high-visibility, powder-coated finish. Ideal for basic demolition work; 3/4" diameter high-carbon steel; slotted claw and beveled ends for functionality and performance. Bar is made of hand forged hard, USA steel with a wide, heat treated cutting blade. Bar is drop forged and heated for superior strength during prying, digging and tamping with hexagon steel construction for enhanced strength. Gooseneck pattern. Forged of high carbon heat treated American steel with a 90 degree ripping claw that fits in close quarters, a polished thin blade for ripping and 3 nail pullers; features a wide range of prying, ripping and nail pulling. Drop forged heat treated steel construction. Offset, hexagon steel with large capacity extracting claws and combination puller. Used for industrial demolition, ripping out nails, walls, studs and framework. Stock size 2-1/4", black oxide finish resists rust and corrosion. Bar is drop forged and heated for superior strength during prying, digging and tamping with hexagon steel construction for enhanced strength. Gooseneck pattern. Rounded 90 degree prying end for leverage and prying; tri-lobe design for comfort and strength; multiple nail pullers for flexibility and nail removal; pointed beveled ends for penetration and nail pulling. Made of forged, high-carbon steel able to withstand 975 ft-lbs. of bending momentum; with a slotted claw, beveled ends and high-visibility, powder-coated finish. Bar is drop forged and heated for superior strength during prying, digging and tamping with hexagon steel construction for enhanced strength. Gooseneck pattern. Rounded 90 degree prying end for leverage and prying; tri-lobe design for comfort and strength; multiple nail pullers for flexibility and nail removal; pointed beveled ends for penetration and nail pulling. Made of forged, high-carbon steel able to withstand 975 ft-lbs. of bending momentum; with a slotted claw, beveled ends and high-visibility, powder-coated finish. Rounded 90 degree prying end for leverage and prying; tri-lobe design for comfort and strength; multiple nail pullers for flexibility and nail removal; pointed beveled ends for penetration and nail pulling. One piece forged steel bar that serves as a 4-in-1 tool for prying, splitting, board bending and striking jobs. Made of tempered steel with a textured grip weighs 2.5 lbs. Bar is drop forged and heated for superior strength during prying, digging and tamping with hexagon steel construction for enhanced strength. Gooseneck pattern. Made from one piece forged steel bar for increased durability with two tiered jaws for grabbing common dimensional lumber and decking. Beveled nail slot for pulling and prying nails. Textured grip. Renovators, contractors and deck builders will all benefit from the lightweight, durable, multifunctional utility bar. The increased functionality leads to less tools on the jobsite. This bar features a 2x4 grabber, striking surface, 7/8 in. tri-lobe stock and an extra wide pry end with precision ground edges. Bar is drop forged and heated for superior strength during prying, digging and tamping with hexagon steel construction for enhanced strength. Gooseneck pattern. Made of heavy duty hex stock, bar has a push/pull action. Black with polished and clear coated head and chisel. Made of heavy duty hex stock, bar has a push/pull action. Black with polished and clear coated head and chisel. A high performance tool for serious do-it-yourselfers, contractors and professionals; unique rocker head for noise power without blocking; wrecks fencing with greater leverage; pry's flooring by pushing and pulling with equal force; double claw for shingles. 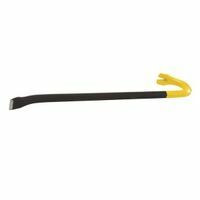 Multi-purpose demolition tool made of one piece forged steel with a sledge hammer face, ripping hook and a textured grip. Weighs 8.5 lbs.